MANHATTAN, NY – After quitting his job at a prestigious law firm, local lawyer Fred Gaily is putting his professional reputation on the line to prove that homeless mental patient Kris Kringle is the real life Santa Claus. “Faith is believing when common sense tells you not to,” proclaimed Mr. Gaily, when explaining why he took the pro bono position to defend the jolly, bearded man who was recently committed into a mental institution after striking psychologist Granville Sawyer on the head with his cane. 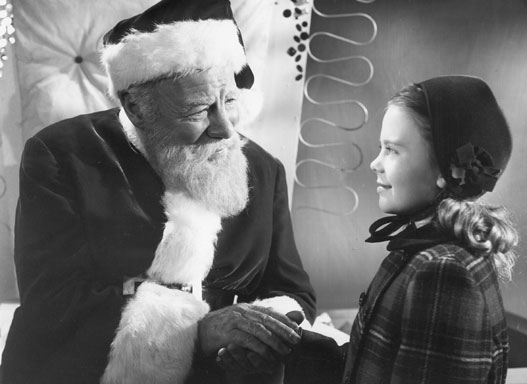 Mr. Gaily first met Mr. Kringle through Doris Walker, a single mom of a depressive daughter, after she hired Mr. Kringle off the street for the Macy’s Thanksgiving Day parade. Mr. Kringle took the retail world by storm, reconciling the bitter rivalry between Macy’s and Gimbles, but has since landed himself in trouble by constantly insisting that he is really Santa Claus. District Attorney Thomas Mara rested his case yesterday after Kris Kringle asserted under oath to being the fictional Christmastime character. At press time, sources confirmed that, with his back seemingly against the wall, Mr. Gaily had a crazy idea and was putting in a telephone call to the U.S. Post Office. It’s a miracle she’s smiling.